Importance of Aerosols (Particulates): Another Failure of the IPCC and ‘Modern’ Climate Science | Watts Up With That? I was halfway through the final draft of this article when the study appeared in Natural Geoscience titled “Substantial large-scale feedbacks between natural aerosols and climate.” A useful summary was provided in WUWT, but it failed to identify all the severe limitations of the work, not least of which is that the evidence was produced using a computer model. Think about that! The authors admit the climate models don’t work, otherwise, there is no need for their research, but then use them to prove their hypothesis about one reason why the models don’t work. Cycles exist for global warming alarmists but only in the use of classic cyclical arguments. Like all the segments of general climate modelling research for which there is no or inadequate data, they produce a subset, “a global aerosol model.” The same limitations and inadequacies that apply to the Global Climate Models (GCM) apply to these subset models. What data are the models built on? We have no measures of the number of particulates or the amount of water vapor in the atmosphere or how they vary over time. The reality is their study is completely unachievable and any findings meaningless, just as it is for the GCMs. The first thing they must do is identify all the problems from lack of data, to lack of understanding of the mechanisms through to even a minimal understanding of climate and the causes of change. I identified some of them in a few articles here, here and here. If you read the Intergovernmental Panel on Climate Change (IPCC), they admit in Assessment Report 5 (AR5) the serious limitations. Clouds and aerosols continue to contribute the largest uncertainty to estimates and interpretations of the Earth’s changing energy budget. This chapter focuses on process understanding and considers observations, theory and models to assess how clouds and aerosols contribute and respond to climate change. The quantification of cloud and convective effects in models, and of aerosol–cloud interactions, continues to be a challenge. Climate models are incorporating more of the relevant processes than at the time of AR4, but confidence in the representation of these processes remains weak. However, the problems are much more fundamental than the IPCC, and the Natural Geoscience article allow, or for that matter many so-called skeptics. It was known for a long time that there were more clouds forming at any given time than the number of condensation nuclei (CN) available in the atmosphere. Condensation is the phase change of water from a gas to a liquid. Theoretically, it occurs when the air temperature reaches the Dew Point temperature, and the Relative Humidity (RH) is 100 percent. Actually, it begins before that temperature is reached. All that appears quite straightforward, but as with all these weather and climate issues, there is much more to the story. In each case, the missing portion or range of error is sufficient to offset all the certainty claims of the (IPCC). The confusion begins with the identification and definition of constituents of the atmosphere. They fall into the traditional categories of solid, liquid and gas. Water is unique and presents unique problems because it occurs in all three forms. Historically, the solid material was referred to as particulates, but then the term aerosol was introduced. Wikipedia illustrates the situation. A suspension of airborne solid or liquid particles, with a typical size between a few nanometres and 10 μm that reside in the atmosphere for at least several hours. For convenience the term aerosol, which includes both the particles and the suspending gas, is often used in this report in its plural form to mean aerosol particles. Aerosols may be of either natural or anthropogenic origin. Aerosols may influence climate in several ways: directly through scattering and absorbing radiation (see Aerosol–radiation interaction) and indirectly by acting as cloud condensation nuclei or ice nuclei, modifying the optical properties and lifetime of clouds (see Aerosol–cloud interaction). There is no definition of particulates. 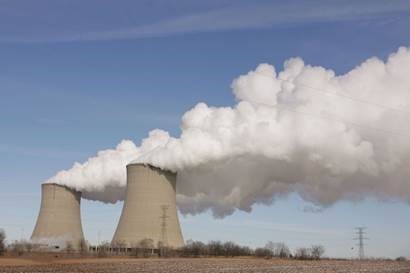 Very small solid particles emitted during the combustion of fossil and biomass fuels. Particulates may consist of a wide variety of substances. Of greatest concern for health are particulates of diameter less than or equal to 10 nm, usually designated as PM10. This is like the inaccurate, interchangeable, use of carbon dioxide and carbon when the former is a gas and the latter a solid or the change from global warming to climate change when the facts no longer fit the theory. · It will require a large-scale vertical eruption that injects volcanic dust into the stratosphere. 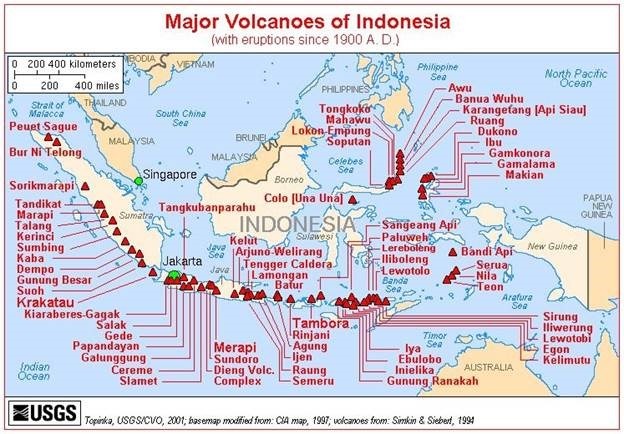 · Because it is near the Equator and at the same latitude and close to Tambora. Figure 1. · It will have the greatest global impact within a year as the dust takes that time to circulate. · The dust will circulate throughout both hemispheres via the mechanisms of the Hadley cell and the transfer of surplus heat energy at the equator to the deficit region of the Polar regions. · Global cooling will occur by the partial reduction of incoming solar radiation (insolation). · A Reduction will occur across the entire shortwave spectrum but will vary in intensity in different wavelengths. · For example, if there is a high percentage of Sulphur particles it will create water droplets that will filter out a higher percentage of yellow light. · Reduction of the yellow light is critical for growth, especially ripening, so crop yields will be impacted. H. H. Lamb was the first (1970) to attempt to determine the amount of volcanic dust in the atmosphere with his creation of the Dust Veil Index (DVI). The representation of cloud processes in climate models has been recognized for decades as a dominant source of uncertainty in our understanding of changes in the climate system (e.g., Arakawa, 1975, 2004; Charney et al., 1979; Cess et al., 1989; Randall et al., 2003; Bony et al., 2006), but has never been systematically assessed by the IPCC before. Aerosols of anthropogenic origin are responsible for a radiative forcing (RF) of climate change through their interaction with radiation, and also as a result of their interaction with clouds. 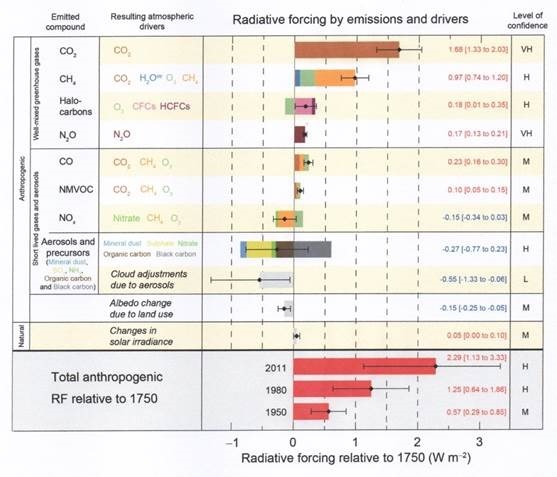 Quantification of this forcing is fraught with uncertainties (Haywood and Boucher, 2000; Lohmann and Feichter, 2005) and aerosols dominate the uncertain-ty in the total anthropogenic RF (Forster et al., 2007; Haywood and Schulz, 2007; Chapter 8). Furthermore, our inability to better quantify non-greenhouse gas RFs, and primarily those that result from aerosol–cloud interactions, underlie difficulties in constraining climate sensitivity from observations even if we had a perfect knowledge of the temperature record (Andreae et al., 2005). Thus, a complete understanding of past and future climate change requires a thorough assessment of aerosol–cloud–radiation interactions. Despite this, they list their level of confidence of aerosols and precursors as High (Figure 2), but that only applies to anthropogenic sources. It would be very low to non-existent for natural sources and their impact. Before the IPCC we knew that the major sources of condensation nuclei (CN) were salt from the oceans and the clay particles. I can attest to the salt in the air because after long anti-submarine patrols, flying mostly below 300 m, our aircraft came back coated with salt and had to be washed down in a special hangar. Clay is the finest particle breakdown of rock in the weathering process moves from parent material to boulder down to clay (Figure 3). Each of these particles has different abilities to attract and control the rate of condensation and the temperature at which the water droplets formed around them freezes. For example, salt will modify the temperature at which ice crystals (frozen water droplets) form making it different than a clay particle. The water droplet can be liquid over a wide range below freezing, that is super-cooled, below freezing. Some particles are identified as hygroscopic, that is they attract water more easily than others. We also knew that there were not enough CN to explain all the condensation and cloud formation that occurred. This led to cloud-seeding, an early form of geo-engineering. The type of CN determines the physical and chemical abilities of the water droplet and the raindrops they combine to create. This includes refraction, reflection, and absorption of both short and long-wave energy. It also includes the air-gas interchange between the surface of the droplet that establishes its properties. All rain is acid rain with a PH less than seven (7) because it absorbs CO2 from the atmosphere. A 2008 article by Naohisa Takagaki titled “The Effect of Raindrops on Interfacial Turbulence and Air-Water Gas Transfer,” illustrates the point. Important questions are how much water is there in the atmosphere and how does it change over time? The USGS gives an estimate of 3,100 cubic miles (mi3) or 12,900 cubic kilometers (km3). How much does potential surface area for CO2 absorption vary with a one percent change in the number and nature of water droplets in the atmosphere? How much CO2 is ‘washed out’ of the atmosphere by precipitation. As far as I can determine, nobody knows, but it is possible it equals the total amount humans produce. This also raises the question about how much atmospheric CO2 is reduced because humans are adding water vapor to the atmosphere (Figure 4). But that speaks to yet another problem because, the practice of not doing balanced cost/benefit analyses, or using net data when it suits and gross data when that fits the agenda better. It is very disturbing that the IPCC Science Reports show the authors know the input is tomfoolery. One can only conclude what Niccolo Machiavelli observed. When we allow science to become political, then we are lost. We will enter the internet version of the Dark Ages, an era of stifling fears and wild prejudices, transmitted to people who don’t know any better. As I write the IPCC gear up for yet another set of Reports (AR6) to transmit to the ill-informed by 2021. December 10, 2017 in Aerosols, IPCC. Makes uncertain sense to me 🙂 The GCMs don’t want to deal with particulates because it may stray them from their theory. Substituting models for data is a self fulfilling prophesy. So lets see, the global circulation models do not handle thunderstorms, or clouds in general, well, The particulates and aerosols interact with the clouds, but are not handled well either. The effect of CO2 is probably overstated. And I am sure I have missed several other issues, beyond the sheer difficulty of simulating global climate. But nevertheless, the green blob asserts that everyone should make economic and social policy on the basis of those models. That’s OK we’ll wallpaper over those ‘features’ with telconnected heat from the deep oceans. Let us not forget that clouds are aerosols, too. Exactly. Every politician and green activists knows that certainty about the future is exactly in proportion to uncertainties in the model. Computers turn uncertainty into government funding as long as you know how to express the outputs. In the article “Global atmospheric particle formation from CERN CLOUD measurements,” sciencemag.org, 49 authors concluded “Atmospheric aerosol nucleation has been studied for over 20 years, but the difficulty of performing laboratory nucleation-rate measurements close to atmospheric conditions means that global model simulations have not been directly based on experimental data….. The CERN CLOUD measurements are the most comprehensive laboratory measurements of aerosol nucleation rates so far achieved, and the only measurements under conditions equivalent to the free and upper troposphere.” (December 2, 2016, volume 354, Issue 6316) The article emphasizes the importance of replacing theoretical calculations in models with laboratory measurements. Why have the results of the CERN CLOUD experiments been ignored by both sides on the climate change debate? Are the spokespersons on both sides too heavily vested in their respective narratives to consider other ideas? The CERN results demolish the credibility of the GCMs. how can you seriously write that “both” side of debate ignored the results of the CERN CLOUD? WUWT’s most recent reference to the CERN CLOUD experiments is dated May 14, 2011. The breakthrough results were reported in late 2016. Seriously, both sides are ignoring the results. I missed the 2016 reference. Sorry about that. No one is ignoring it. Everyone knows what they found, and it not only validates what Svensmark has been saying, they concluded the effect is stronger than expected. For that reason the finding must be ignored, buried, hidden behind a wall of obfuscation, deep-sixed, declared to be ‘too little upon which to based a reconsideration of the climate models’ and so on and on. What did they conclude? They concluded that they need five years to prove it conclusively. How convenient. How helpful. How deceitful of them. The cloudiness is running way ahead of models and as they cool the surface by hundreds of Watts per sq m it is clear that cloud cover modulation, as an amplified response to solar activity, is a major numerator in the climate equation..
Having written computer programs for more than 40 years, I can confirm that the above quote is true. This, sadly, is also generally true, though in my experience, the best users of computes are those people who are always a little skeptical of the output from a computer and are willing to double-check the output themselves. A good computer programmer cherishes these people because the help you to make better computer programs. One of my favorite quotes! Back when people did things without computers it was easy(er) to find who effed-up what and I think people were more careful. What percentage of (white collar, technical) people under the age of, say, 40 these days could still perform their jobs without software? Creation of clay particles requires chemical processes, not just physical erosive processes. Good article, just a couple of comments. The “p” in pH should be lower case, denoting the -log. Even though it’s no big deal, as a chemist, it bugs me when people get these terms wrong. Similarly, I’m also bugged by incorrect references to the non-existent compounds Co2 (diatomic cobalt), H20 (eicosa hydrogen), etc. The less well defined term “particulate” somewhat makes sense in that there are so many possibilities of particles. That’s not the case with carbon dioxide vs carbon. In my opinion, carbon dioxide should be used in most cases when referring to AGW emissions because it is the most accurate and precise term. “Carbon” is ambiguous. It makes sense to use “carbon” when an elemental mass balance is being derived from the conversion of different carbon species. Too often, “carbon” is being used incorrectly for the purpose of deception. I understand that if the aerosol effect was modeled realistically, they would be forced to reduce the CO2 sensitivity to a very modest value. That, of course, is anathema. Actually it is the inhalable (deep) portion of that range which concerns health professionals. PM4.0 is ‘thoracic’ and poses a health risk (depending on what type of particle it is. The idea that there is a ‘dew point’ is as accurate as there is a boiling point. Read the about Boiling Point myth. Water at atmospheric temperature boils at 98 to 200 C depending on the container. Water vapour condenses on aerosol particles at different temperatures because of the nature of the surface and the presence of other particles acting in concert. The particles may be charged, or not, and so on. The boiling point, freezing point and dew point are affected by the surface of the container (or particle). The obvious example to use in explanation is the super-saturation of water vapour well below the dew point. Ah, yes, of course it needs somewhere to start condensing, but when that starts depends on what the condensing surface is. Correction, “atmospheric pressure” not “temperature”. To raise the boiling power of water, clean the container very well removing all spiky protrusions. What a wonderfully-written article/essay, Dr Ball. It was so clear, even I could follow it! And it answered some questions that I have had in my head for quite a while. And thank you for giving us (me) the benefit of your knowledge. There is certainly a definition of what an aerosol particle is. It is specified according to its aerodynamic diameter, meaning: what the diameter would be if it was a globe. Many years ago, in the early days of RealClimate, before they removed half my comments, there was an interesting discussion about the role of (human) aerosols on the effect of CO2. Regardless of the atmospheric models uncertainty, the measured increase in global atmospheric CO2 concentration is accelerating to a level far above preindustrial levels. Are you disputing that this increase is not anthropogenic? Sorry but this “measured increase” is based on comparison of paleoclimate data and atmospheric measurements, i.e., apples vs. oranges. Older atmospheric measurements which suggest the difference is far smaller are dismissed because they don’t support the Eco-Fascist story line. Human CO2 emissions are minuscule compared with natural emissions, and are nothing but noise when considered in the context of total emissions. The assertion that the increase is down to human emissions is nothing but more ASSUMPTIONS. I did my masters at UniWat way back in 1965. One standard thing we did was to run our models using progressively single precision, then double precision and then quad precision. (single precision was 36 bits back in those days which AFAIK gave 1 more bit of scale factor and 2 more numeric precision bits. 32 bit floating point has marginal utility.) If the double precision and quad precision results did not match then there was something seriously wrong with our models that required a rethink. At the time we were not aware of chaotic systems. Our second standard thing was that we only placed limited confidence is using a model for projection. Sure we used them for interpolation which was fine assuming that the models were stable as above. Climate models do not seem to meet either of these standards. Some people claim that averaging over different models eliminates any effects of chaos but this is only true if the models produce a balanced distribution around the true value which of course is unknown. +10 Dr. Ball; that made me lol..